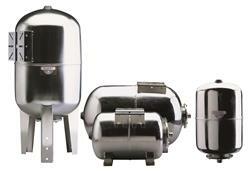 ULTRA-INOX PRO: The expansion tanks in this line are entirely made of stainless steel. They are especially used for systems that produce sanitary hot water produced by a boiler or from plate heat exchangers. They are excellent choices for situations that frequire high hygienic standards and a product life time that is practically limitless. The membrane is absolutely non-toxic and is drinking and food grade. This model of tanks, also for their reduced volumes, are particularly useful for anti-water hammer effect in water systems, preventing vibrations or noises. They can also be used with reduced flow pumps. Available volumes range from 24 to 100 liters (5.3 to 22 UK gallons), horizontal or vertical.